Something has completed a full cycle. It is an honour and privilege to offer you this small gift which comes from my heart. It is: E iti noa ana nā te aroha - A small thing given with love. There is much meaning imbued into this Taonga. There is a language of symbolism that shines through this creation that I am unable to easily express in words. I will endeavour to explain some of the more obvious meanings and allow you overtime to come to understand the subtler meanings through sitting quietly with this Taonga. The essence of this design represents that you have taken the white, black and red threads, they have passed through the needle. They have now been woven into a beautiful fabric of precious material. This is symbolised by the Manaia’s wing turning into the needle that weaves and the resulting fabric which has been created. There is a protruding inlay of Mother of Pearl. This is symbolic of you being a ‘Mother to the world’. Not only have you been a kind mother to your own tamariki, you have taken the responsibility for caring for the whole community and especially for those who have little or no voice. As Pootatau Te Wherowhero wished, you have held fast to divine lore, unconditional love and resolute faith. The protrusion of this Mother of Pearl indicates that you have risen above much adversity to achieve a great and yet humble selflessness. The surface design that cradles this inlay and the wave design of the bone it sits in, is like the waka riding the wave and staying steady and resolute. This is symbolic of the great love and the force of your will that has carried your unconditional love and resolute faith, and transformed it into actions that benefit others. On the right-hand side of this wave like form from where it is arising, is a hook-like koru. This represents your ‘hook like compassion’ always reaching out and available to those who want to grab on and pull themselves up. It is on the inside of the bone-carving because the protection of wisdom surrounds it. The Koru resting on the head represents the new chapter of life unfolding. 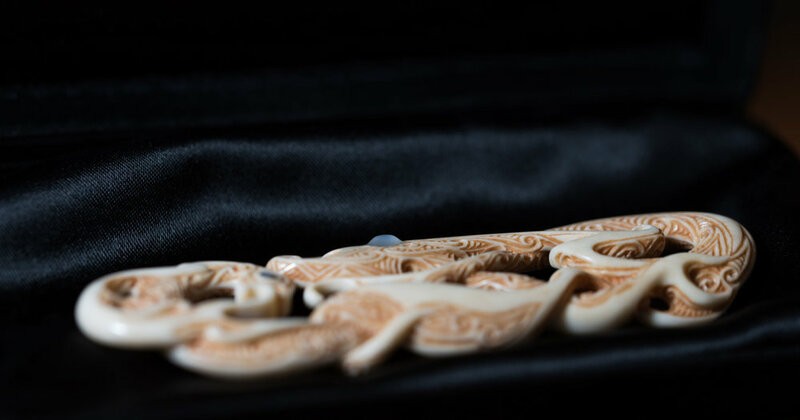 The Koru on the inside of the carving underneath this shows that it is the inner worth and inner achievements which is the most important. For it is these that we carry with us long after this body ceases. On the back of this Taonga is depicted the all-pervasive lifeforce that gives rise to great energy to fulfil all virtuous wishes. The four mountain peaks are symbolic of the four great practices of attainment. Purification, refuge, making requests and receiving blessings. Mere, is not an ordinary person. This is the truth. Her good qualities are quite extraordinary. I am one of the privileged many who have benefited from her kindness. I sincerely hope you enjoy the carving and over time come to fully understand all the various layers of meaning imbued in these creations. I wish you and your whānau the deepest peace and happiness.